QuakeCon isn't just a celebration of all things id Software (and a touch of Bethesda) it's also one of the longest running bring-your-own-computer gaming events in the world. Oh and this year, on top of the keynote, the panels, the gaming rigs, there's a chance to get your hands on Rage. If you've never been, but want to swing by this week - yes, this week - don't worry. Kotaku is happy to help you survive the rigors of QuakeCon attendance. If this is your first time attending the con, don't go unprepared. 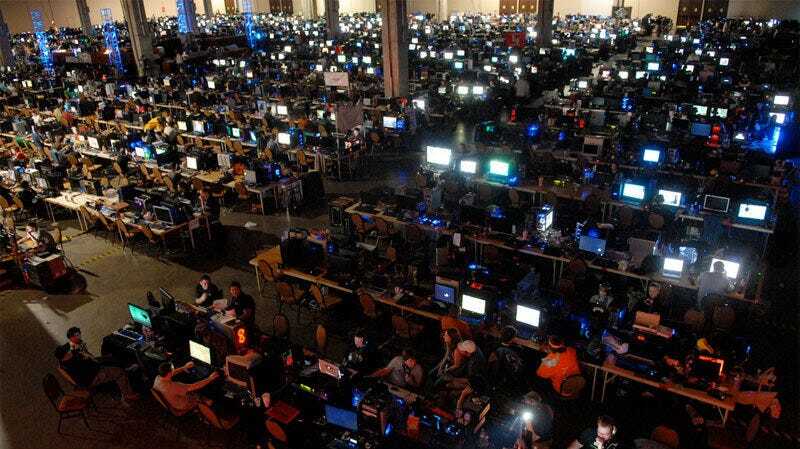 Armed with the right gear, some helpful hints and a heaping dose of common sense, you'll survive all four days of one of computer gaming's biggest LAN parties. And if you see a Kotaku editor you recognize at the Con, don't be shy. • Shoes: While many of those attending Quakecon come to set up camp in the bring your own computer area, there's enough other things going on that an entirely different group of people show up to take in the games, the panels, the talks and the demos. Most BYOCers will likely not need to do a ton of walking, the other type will find themselves doing a lot of cross-hotel wandering. Stay comfy in a pair of Supernova Riot 2 Trail-Running shoes, Vans or Clarks Desert Boots. • Clothes: Dallas is a blisteringly hot city. A Texas city so warm it's called the Devil's Oven.. not really, but I call it that. And why not? During my time in the Dallas-Forth Worth area, the city hit temperatures topping 115°. So be sure to bring plenty of t-shirts and shorts. But don't forget that the sweeping BYOC area, and it's oodles of temperature sensitive gaming rigs, is kept quite chilly by the pumped in air, so you might want to bring along some sweats too. • Gear Bag: Bring roomy, mostly empty, reliable storage—tote bag, backpack, over-the-shoulder courier bag—to QuakeCon. Stuff it with the bare essentials, like your phone, camera and snacks. Mishka NYC's Panzer rucksack and Gravis' line of bags come highly recommended, as does Incase's nylon series. • Electronics: Most important, bring a camera. You'll see some amazing gaming rigs, meet some wonderful folks and check out some great games. You'll want to snap pics. • Your Rig: This is, afterall, a mammoth LAN party, so you may want to bring your gaming rig. If you're headed to the BYOC, don't forget to pack your monitor and PC/Mac (desktop or laptop) plus your keyboard, mouse, and headphones. As an alternative, this year you can bring a console instead. Just remember that everything you need needs to fit in the allotted three feet of table space. • Rig Transportation: Have a plan so you don't break your back or equipment. With all the equipment you're bringing, be sure you have something to transport everything in – be it a dolly, a cart, or your old Radio Flyer. • Water & Snacks: Hosting a con in a hotel has its advantages. Namely, good eats. You can't survive on BAWLs all weekend. While you'll have plenty of time to venture off to downtown Dallas for some choice food, there's also plenty of options at the hotel. QuakeCon favorites include Media Grill + Bar (lunch and dinner) and Gossip Bar (breakfast). There's also room service, but remember they stop serving each night at 12am. If you want to keep things cheap you might want to stock up on your own grub. Clif Bars and bananas. And whatever you do don't forget the water, plenty of water. (I like the Thermos Intak) should tide you over and keep you hydrated, letting you save your dedicated meals for something finer. • Vitamins & Protection: The all-nighters and panels can wreak havoc on your eating patterns, so supplement with vitamins, especially since you're going to be around tens of thousand of people handling mice, controllers and keyboards. Keep some Purell around and wash those hands or you'll come back from the Con with the Nerd Flu. • Eat: It would be a crime against humanity, and your gut, if you made your way to Dallas and never ventured outside the hotel to grab a bite to eat. The city is packed with amazing places to grab unforgettable meals. I can't even begin to summarize all of the places you could go, so I'll just mention a few highlights and leave it to more savvy and familiar commenters to expand the list. Mike Anderson's BBQ is, like all great barbecue joints, an outwardly forgettable restaurant. But inside you'll find the ribs, pulled pork and brisket that made this joint the Dallas Observer's pick for best barbecue in the city. The Angry Dog is a great place to pick up a great burger. Sfuzzi's Pizza is a must if you're visiting the town, as is the Heart Attack Grill. • Drink: You might want to check out the Inwood Lounge at the Inwood movie theater if you're in the mood for a mean martini. Barcadia? Yes please. Combining beer with video games never gets old. NEVER. You should also take the time to check out Deep Ellum, home to nearly 50 clubs, restaurants and shops in what was once the warehouse district of Dallas. Back in the day they had some pretty amazing jazz bars too. • Sleep: QuakeCon is back at the Hilton Anatole, so that's your best option for where to stay. To save on your room, make sure you reserve using the QuakeCon block. As of this morning they still had rooms available. • Go: Getting to the convention is fairly straight forward. You'll just need to find your way to the Hilton Anatole, 2201 North Stemmons Freeway, in Dallas. No Comic-Con or E3 epic lines here. • Hours: Thursday through Sunday, the Con kicks off at 9 a.m. Thursday morning, with the hall opening at 10 a.m. and scheduled events throughout the rest of the week. QuakeCon is a free bring-your-own-computer gaming event held annually in Dallas, Texas hosted by id Software, makers of Quake, Doom and soon Rage. The event started in 1996 as a grassroots gathering of fans of Quake at a Garland, Texas hotel. The event ended with a surprise appearance by id Software developers, who weren't a part of organizing the original event. John Carmack chatted with the group of 100-or-so people about the future of id and game development. The event has been held annually since, growing to more than 8,500 people last year. After you've secured your BYOC spot, if you're going to, make sure to check out the keynote. It's become tradition at QuakeCon that John Carmack does a keynote address, and it's always worth a listen, as he's sure to deliver thoughts on where he sees the game industry going in the coming years. And if you don't understand everything he says… that's okay. • It's Not Just About Quake: It might be called QuakeCon, but this LAN party has people playing everything and anything under the sun - FPS, RPG, fighting games… they're all welcome. And for the first time ever, the public will be able to play id's latest, Rage, in the exhibit hall. If you want to hop on before the lines start, be ready when the exhibit hall opens. • The Exhibits and Panels: Outside of the BYOC, there's plenty of fun at this year's event – including gameplay presentations for Skyrim and Prey 2, as well as panels featuring members of id Software, Bethesda, Insomniac, Respawn, and Arkane Studios. • Master Pancake Theater: For the fourth year running, comedy group Master Pancake Theater will be delivering laughs to QuakeCon attendees. Whether you're on Team Jacob, Team Edward, or Team WTF, you'll definitely want to catch their performance Friday night at 9 pm. • And Don't Forget the Quake: Big surprise – QuakeCon has some of the best Quake players in the world. If you're not already participating in the tournaments, be sure to catch the finals in the grand ballroom on Saturday night. Don't take the time to travel all of the way to Dallas Texas and then not look around. The city isn't just host to the biggest Quake tournament and LAN in the world, there's also plenty of fun things to do in your down time. Schedule in a few days post show to see the sites. Deep Ellum is so great it warrants two mentions in this guide. Built in the late 1880s, this Dallas landmark became famous for jazz back in the 1920s. Nowadays you can find all sorts of walk-up clubs with live music to satisfy any tastes. Of course it would be crazy to go to Dallas and not check out The Sixth Floor Museum at Dealey Plaza. The permanent exhibit details the life and sudden death of President John F. Kennedy in the spot where that fatal shot was fired from. If you've got the time it's probably worth swinging over to relatively nearby Fort Worth where you can check out a more Texas version of Dallas, complete with cowboys in big hats, a daily cattle run right through the streets of the city... kinda, and Billy Bob's Texas, the world's largest honky tonk. Most importantly, don't forget: This is a show about everything that makes id games so wonderful. Have fun! And don't worry if you miss something, we have you covered. Have some Quakecon survival tips to share with the group? Please leave them in the comments! A special thanks to Tracey Thompson and the folks at Bethesda and id for helping out with this guide. Once a year all things video game descend on Los Angeles for a nearly week-long celebration of gaming. Comic books! Movies! Video games! Toys! There's so much to see and do at the San Diego Comic-Con, it can be a little overwhelming. Don't worry, Kotaku is happy to help you survive the rigors of comic book convention attendance.